Don't delay in your opportunity to own the greatly desired Iris floor plan at Sun City Mesquite! Located in Split Rail, just steps away from all the wonderful amenities that Sun City Mesquite has to offer! The very popular Iris model is a 2 bedroom and office floor plan, that also offers a gated courtyard in the front that has access straight into the kitchen as well as an extended two car garage for extra toys or storage! 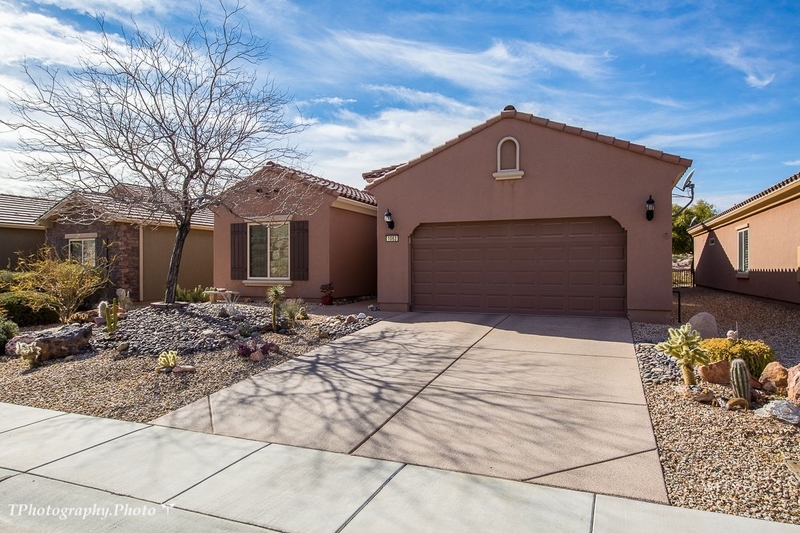 This home has been updated to include a pergola patio in the front courtyard as well as the rear courtyard, privacy glass block wall on the back patio, a beautifully tiled walk in shower in the master bedroom with granite countertops throughout and epoxy flooring in the garage and patio areas. Elevated and positioned for unobstructed views, extending from the Southern mountains to the Mesquite Mesa!